Hoya carnosa, (wax plant), is a woody, vining plant with thick, waxy leaves. 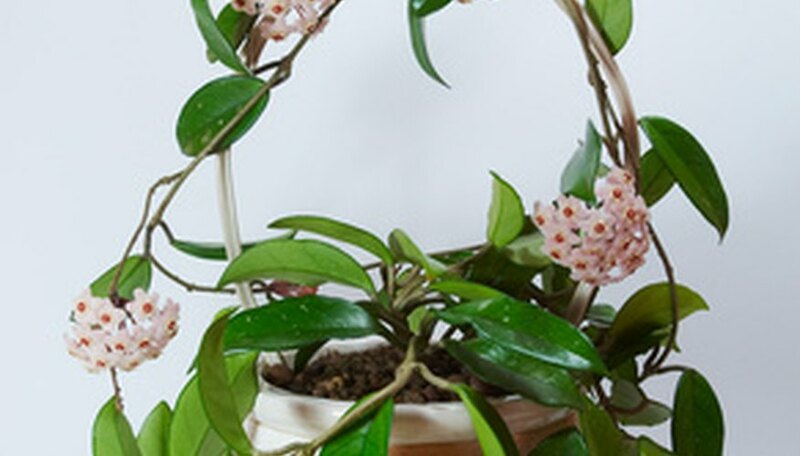 Hoya is often planted in a hanging pot so that the lush foliage and clusters of pink or white blooms can be seen to best advantage. The hoya plant also does well in a tabletop pot, where the heavy vines can be trained to wind around the pot. To root a new hoya, take a stem cutting from a healthy adult plant. Fill a 6 to 8-inch container with a mixture of equal parts clean, coarse sand and peat moss. Be sure the container is clean and that it has a drainage hole in the bottom. Use clean, sharp garden shears to cut several 4 to 6-inch stems from a healthy hoya plant. The stems should be leafy stems rather than long, bare vines. Make the cut just below a leaf. Strip the leaves from the bottom 1/3 to 1/2 of the hoya stems. Roll the cut end of the stem in powdered rooting hormone and plant the stems in the potting mixture. Several stems can be planted, not touching, in one container. Water the potting mixture to settle the mixture around the stem. Don't over-water, as too much moisture will rot the hoya stem. The potting mixture should be evenly damp, but not spongy. Put the container in a clear plastic bag, and secure the bag around the container with a string or a rubber band. Place the container in bright sunlight, but don't put it in a sunny window as direct hot sunlight will intensify through the plastic and burn the hoya stem. Begin checking occasionally for roots after 3 to 4 weeks. Remove one or two cuttings from the potting mixture with a spoon, look for roots, then replace the cuttings in the potting soil. Once the roots are at least 2 to 3 inches long, plant each stem in an individual container filled with commercial potting soil. Place the new hoya plants in bright light. Hoyas need a minimum of four hours of sunlight per day. Keep the soil damp, but don't water excessively. Never allow the bottom of the pot to remain in water. Water the hoya sparingly during the winter months. Allow the potting soil to dry completely between each watering, then water only enough to dampen the top inch of potting soil.